Gunpowder (0-2) upon non-explosive death. Music Disc (1) when shot by a skeleton. The creeper is a handless humanoid creature with four short legs hanging off the bottom edges of its rectangular body. It has large, empty eye sockets, a mouth twisted into a signature sad expression, and a greenish, grass-like camouflage skin. Creepers represent the most readily available source of gunpowder, and are therefore critical to the production of Powder Kegs, Firework Stars and Firework Rockets. Creepers are hostile mobs that make use of a suicide-style attack: It approaches any players within a 16 block range and then explodes, causing damage to players as well as surrounding blocks and entities. Creepers spawn at night, and in locations with a light level of 7 or less, just like most other hostile mobs. However, unlike Zombies and Skeletons, Creepers will not catch fire in direct sunlight, and those spawned in darkness will continue wandering and attacking throughout the day regardless of light level until they are killed or despawn. Creepers are especially dangerous mobs due to their almost completely silent approach, save for light footsteps and an occasional rustling noise that is compared to the player walking on leaves. A Creeper will warn the player moments before it explodes with an infamous burning fuse noise. Their explosion is devastating at short range, to both entities and structures. When within one block of a player, a Creeper will hiss loudly, start flashing and inflating, and violently explode after 1.5 seconds. Killing a Creeper before the countdown finishes will prevent it from detonating. 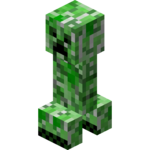 A Creeper's detonation can be halted if the player moves out of the blast radius, or knocks the Creeper back sufficiently to do the same via an attack (about 3 - 5 blocks, depending on the difficulty setting). A Creeper's explosion is dependent on the difficulty level. Charged Creeper explosions are twice that of a normal Creeper. All dropped items in the explosion radius will be destroyed. A certain percentage of blocks destroyed by the Creeper will survive the blast and can be picked up. Harder blocks caught in an explosion will shield blocks behind them to some degree. If a creeper detonates in water, it does no damage to the environment. A charged Creeper is created when lightning strikes within 3 - 4 blocks of a normal Creeper, which significantly increases its explosive power. Charged Creepers are distinguished from normal Creepers by the blue aura surrounding them. Many players refer to charged Creepers as "Electric" or "Lightning" Creepers. Creepers never spawn initially charged. Charged Creepers take damage from the initial lightning strike, so it takes fewer attacks to kill them than ordinary Creepers. Their countdown timers act the same as uncharged Creepers, both in terms of range and time. An explosion caused by a charged creeper is more powerful than the explosion caused by a regular creeper, both in force and radius. It is possible for lightning-struck Creepers to catch fire from adjacent struck ground and burn to death. This page was last modified on 15 October 2013, at 00:12.